The flamboyant Vijay Mallya of UB Group is known for taste in his life. His passion for Horses, Race Cars, Flying, Yacht and Lifestyle retailing is something to cheer about, especially for Bangaloreans. The 125,000 sft mall will retail only in top of the line brands such as Gucci, Fendi, Rolex, Omega, Dunhill, Louis Vuitton and Kimaya across categories such as watches, jewellery, accessories, home, electronics etc. Luxury retailing in India is estimated to be Rs 1,550 crore market growing at the rate of 20% YoY. UB City also houses the luxury hotel, J.W.Marriot. This will be the brand’s first store in South India, in what promises to be the most luxurious destination of Bangalore. The 1,700 sft store is scheduled to open in the first quarter of 2008. The store will retail handbags, leather goods and accessories. 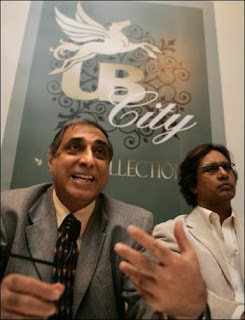 Under single roof, UB City – The Collection will be the largest Luxury retailing space in India.